Nowadays marketers have many different ways to target consumers and buyers. With the rise of digital channels, subsequent ad options, and trackable interactions the temptation is to throw money behind metrics and proclaim these channels as the most effective at our disposal. With the rise of marketing’s role in influencing real sales and being an innovative business partner, the pressure has been on throwing money behind efforts that appear to contribute to direct sales via the latest digital trend and channel. Our infographic summarises some key channel insights when it comes to usage and effectiveness. Therefore, channels such as radio, newspapers, magazines, out of home, and direct mail can be overlooked in terms of effectiveness. Even the original digital communication email is now considered old hat, despite research often highlighting it as the top performing tactic in the mix, particularly within B2B. And it seems us marketers can be the ones most susceptible to overestimating effectiveness in favour of the latest trend. Not surprising considering we’re often briefed on a desire for the new and experimental over the tried and tested.  So, when Ebiquity released an evaluation of traditional vs more modern marketing techniques (Re-evaluating Media) that revealed marketers underestimate the effectiveness of the traditional methods which are often seen as ‘dated’ we were interested in the results, and of course methodology. Targeting. Important to ensure you get your ad in front of the right people, at the right place and the right time. Return on investment (ROI). Whether a decrease in Cost per Acquisition (CPA), more sales orders, influenced pipeline, or increased market share, what the campaign results in vs the cost matters. Connects the audience with the brand in a positive way. It goes without saying that increased brand preference, perception, or likelihood to buy from the brand is a good thing. Increases the brand’s relevance within its target audience. Helping people understand how and why something is useful and appropriate for them is an important part of the customer journey. Reaches as many of the target audience as possible. Whether reached via paid targeting, shared content, utilisation of owned channels, general WoM or buzz – the more the merrier. Using these factors as indicators of effectiveness they asked marketers which they believed would be the most effective channels at achieving these. The below graph shows the most effective channels based on the evidence as to how campaigns actually performed vs the marketers’ perceptions. TV scored top in both showing that marketers are aware of the effect it can have and hopefully shows that they are utilising this to its full potential. This is arguably the ultimate advertising channel and in fact, increases business effects by 40%. And with great targeting options, more specific channels and sophisticated media options via the likes of Sky Adsmart it is a commercially viable option for brands that may have thought it previously unfeasible. Although TV advertisers and agencies underestimate traditional media, this doesn’t mean online video and social media aren’t effective. As in most cases, it depends. It depends on the audience, type of campaign, and the long-term goals. You need to be able to understand your audience in order to see what is effective for that particular market. These mediums, both offline and online, are all effective depending on the audience and depending on the message you are trying to convey. Integrated activity, even when a couple of methods are used, can be most useful when they complement each other. 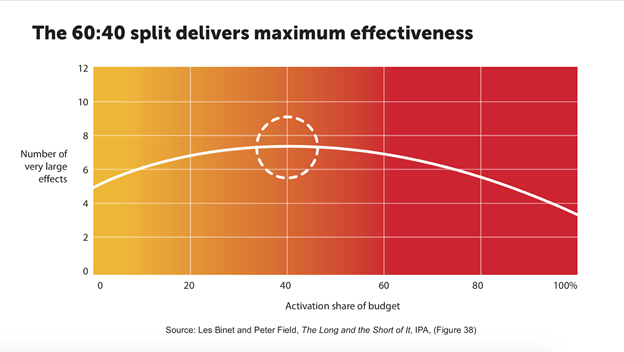 The IPA in the UK recently released a PDF collection of The Greatest Hits of Binet and Field, featuring a summary of the longstanding view that a 60/40 split between brand building and sales activation is best for long-term growth. Each campaign is different, not all campaigns will be able to get an exact 60/40 mix. The idea is that 60% of ad spend should go towards relevant channels that will grow the brand and the other 40% towards short-term results, which can be evenly distributed across online and offline media. 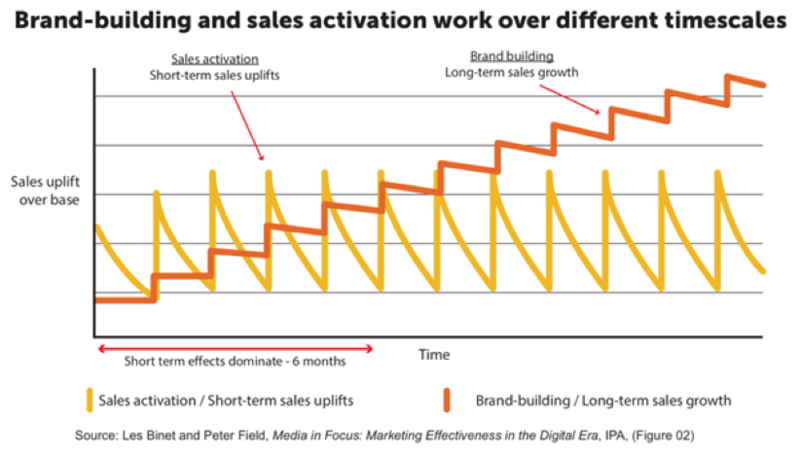 The chart below shows how the approach can be effective in building a brand and achieving sales over different timescales. Don’t follow the latest trend, unless that works for your audience. Embrace a classic combination of traditional and trending to broaden targeting and metrics. Start with the audience, not the channel. Set short and long-term goals and split spend accordingly. And finally, use research to test your thinking, not dictate it.